These are frightening statistics but not surprising, at least not to me. That’s because both my parents have been victims of countless medical snafus. My father’s medical ordeal was so chaotic and painful that, after his death in the summer of 2006, my sister Karen and I made a pact to dedicate ourselves to helping other families with their own medical challenges. Such was the genesis of In Care of Dad. Since our journey began, I have been on the lookout for common-sense tools that make the patient safer. So I was pretty excited when I came across Elizabeth Bailey’s The Patient’s Checklist: 10 Simple Hospital Checklists to Keep You Safe, Sane & Organized. Bailey’s motivation for writing The Patient’s Checklist is much like our own: after witnessing her father’s harrowing medical experience, she felt compelled to share her experience, along with her checklists and forms, to help others avoid the same devastating troubles. In 2006, Bailey’s 81-year-old father was still practicing law and living an active, independent life in New York City. She says that her dad was in good health “except for a mild type 2 diabetes, which he developed in his seventies and controlled through his diet.” But in the late summer he began to experience double vision. He was sent to a prestigious hospital in New York City, where he was seen by the chairman of the ophthalmology department. Bailey’s father naturally had a lot of faith in this highly credentialed doctor. So much, in fact, that he chose never to question the doctor’s instructions, even when it was suggested that he do so. Unfortunately, this new doctor ended up making two decisions for him and both, as it turned out, were significant medical errors. The first was the diagnosis. The doctor focused on an obscure disorder, an inflammation of the temporal artery, instead of ruling out simpler options that could have been easily gleaned from a medical exam and a review of the patient’s medical history. Later, after this particular story had already spun out of control, an emergency room doctor figured out that the double vision had simply been the result of a gradual rise in blood-sugar levels. The second mistake was prescribing an excessive dose of Prednisone, a steroid, to reduce the inflammation he had incorrectly diagnosed. High dosages of steroids can cause a patient to become psychotic, as well as potentially causing heart failure. To make matters worse, steroids given to someone with diabetes, without proper monitoring, can spike blood-sugar levels and induce a coma. These two medical errors set in motion a medical nightmare for Bailey’s dad and her family. He had followed his doctor’s orders without question, even when the pharmacist who filled the steroid prescription raised a warning flag. The results were devastating: the steroids made Bailey’s father psychotic and his diabetes soared out of control. Bailey realized she had to get actively involved in her father’s care, which would be a long and chaotic road to some semblance of recovery. Since she found checklists indispensible in her job as a producer, director, and head of music-video production for two major music labels, Bailey could see the value of checklists in this medical situation they found themselves in. She began researching best practices, then created a set of checklists to help her and her sisters see their father through his health ordeal. Elizabeth Bailey’s father never did entirely recover, but their experience made her a passionate advocate for patient safety. She decided that other families could benefit from using the detailed checklists and forms that she created for her own family. The heart of Bailey’s book is these carefully detailed checklists and forms. 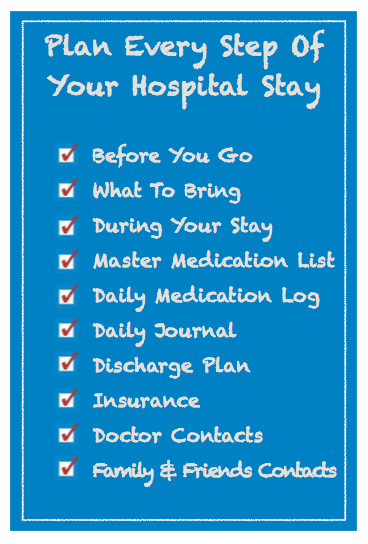 The book is broken down into 10 sections, each with its own checklist, guiding the reader through the essential points of any hospital stay: Before You Go, What To Bring, During Your Stay, Master Medication List, Daily Medication Log, Daily Journal, Discharge Plan, Insurance, Doctor Contacts and Family & Friends Contacts. Bailey’s checklists are practical, well considered and simple to follow. The blank forms, which are included in many sections, are nicely laid out and easy to use. There is no doubt that Bailey’s book gets to the core of preventing medical errors by having patients partner in their own medical care. Her system prompts patients to ask the important questions, monitor their daily care, and keep the communication between patient and the medical team open and fluid. I highly recommend this book. I’ve decided that the very next time someone I know goes into the hospital, I’m going to buy them a copy of The Patient’s Checklist — I’m convinced that this little book can save lives. I hope you’ll do the same. Kim Keller is the Co-Founder of In Care of Dad. She lives and works in New York City. This entry was posted on Tuesday, November 12th, 2013 at 2:25 pm	and is filed under Be Proactive, Book Review, Diabetes, Manage Near or Far, Things That Make Life A Little Easier, Uncategorized. You can follow any responses to this entry through the RSS 2.0 feed. You can leave a response, or trackback from your own site. your daily routine with a new nose and balanced face. get an enormous boost on their self-image. "It is raining still . . . Maybe it is not one of those showers that is here one minute and gone the next, as I had so boldly assumed. Maybe none of them are. After all, life in itself is a chain of rainy days. But there are times when not all of us have umbrellas to walk under. Those are the times when we need people who are willing to lend their umbrellas to a wet stranger on a rainy day. I think I'll go for a walk with my umbrella." Check out Beers Criteria - a list compiled by geriatrician Mark Beers - to learn more about special medication considerations for people over 65.